Even with the presence of Dwayne Johnson, I’m not sure I’m happy watching this. There’s a lot missing from the original story’s magic in this version, where it’s a video game and a teenage girl is stuck in Jack Black’s body. The trailer starts by trying to evoke The Breakfast Club with four kids with very different social statuses getting punished together, and then, for some reason, they find a video game in their school and decide to play it. They pick players, and end up stuck in their bodies while in the jungle. From there, the trailer is literally every clichéd joke about the bodies you can think of. There’s a girl in a man’s body! And that body is Jack Black’s! Kevin Hart—brace yourselves—is short! Isn’t it funny when manly man Dwayne Johnson cries?! And, much like the aged up Poison Ivy in Gotham, it’s still creepy to put a kid’s mind in a body that the creator’s acknowledge is meant to be objectified. Even her pointing out that wearing almost no clothing in the jungle makes no sense doesn’t put a big enough lantern on that. Putting aside the deeply predictable and unfunny humor, the real problem here is that reversing the conceit of Jumanji—the kids all go to the jungle, rather than the jungle invading their home—some of the magic is lost. They don’t have to hide anything from anyone or deal with people not believing them. It’s basically just... generic action movie, with Jumanji slapped on the title. Maybe it’ll have hidden depths as we see more. Only time will tell. 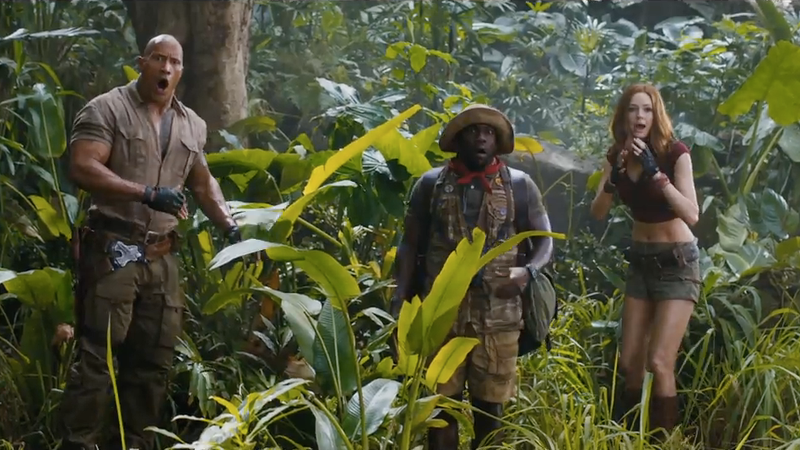 Jumanji: Welcome to the Jungle comes out December 20.